Whether you’re an expert in resume writing or coding computer applications, what better way to practice your skills than teaching others? And you’ll be giving invaluable insight, training, and support to our community’s future leaders. The all-inclusive Life Skills workshop that Propeller facilitated with our Independent Living Program included raffles, Word & Excel training, Mock Interviews, Resume Ideas and lunch. There was also a panel where former clients and Propeller consultants told their stories and inspired our clients. 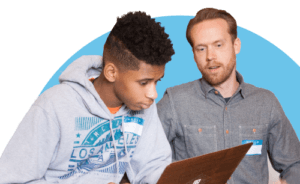 Propeller is always willing to put together classes that benefit the foster youth in our program. If there is a life skill to be taught, there is a class to be had! Volunteering is unlike other team building activity: it lets employees grow together as a group and on a personal level, you’ll gain self-esteem and self-worth. Working towards a goal together gives co-workers a renewed energy around their skills—something that Propeller noticed with their own team: “Partnering with Impact has brought our consultants closer together, and deepened and enriched our connection to the community,” said Jennifer. We walk with Jeff. Undocumented: Young minds feel the strain of families broken apart.